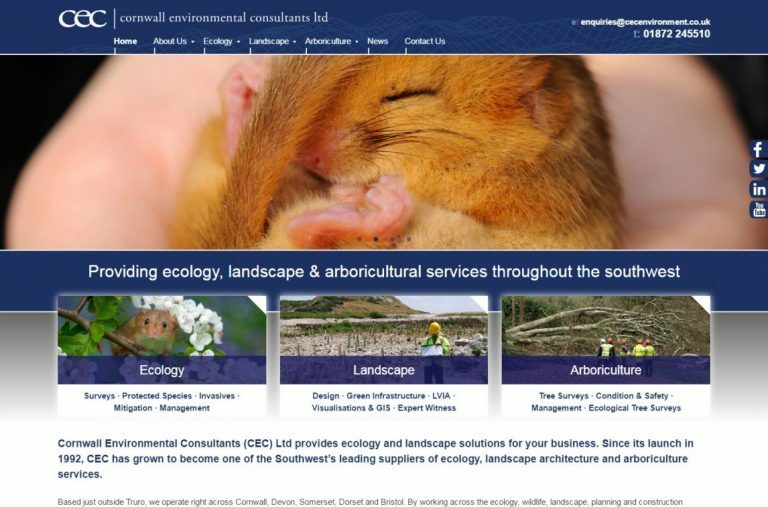 Cornwall Environmental Consultants has a great reputation as being one of the best in the South West, for providing ecological, landscape architecture and arboricultural solutions for many different projects and developments. We, of course, like this. We like it a lot. However, recent customer feedback told us that our website was perhaps letting us down a bit. Not wanting to sit on our backsides and take this lightly, we immediately got on the case and commissioned Aawen Design in Truro to design us a new one. We’ve made it easier to navigate and we’ve also streamlined it so there are not so many pages to choose from. We’ve also refreshed the photographs and included more case studies to highlight what it is we do and how we’ve helped others. We hope you like it! Please feel free to provide us with feedback – is it an improvement? Is there something else that would particularly help you when thinking about your project or development? We would love to hear from you.